If this doesn’t prove the essential spookiness of these mushrooms I don’t know what it will take. This just in from Babs: I have no idea what type of mushrooms these might be. I’m sure someone on Torch Lake Views will have an answer. I did find the color, texture, shape and arrangement of them most intriguing, but had no desire to eat them. Hard on the heels of that missive she forwarded this, from a friend in Pittsburg whose husband is botanist (Yes his name is Allison): Great picture. 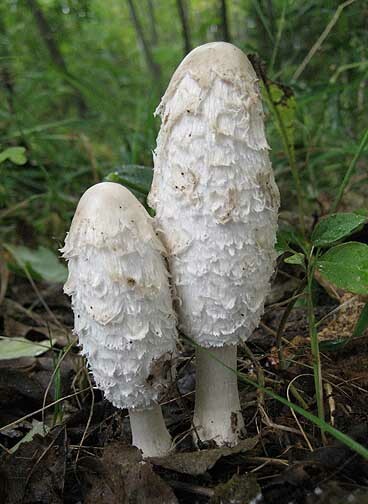 These are called Shaggy Mane. They are a common fall mushroom. Allison suggests that people should not eat them but he knows nothing more than that. Well I guess so. Now do these Shaggy Mane mushrooms remind you of anything else? Like maybe the Victorian mysteries posted here this morning? The ones Andrea says are Shaggy Ink Caps? So we have seen, most likely, the Three Ages of the Shaggy Sort of Mushroom, Whatever Its Proper Name Is, That One That Turns to Black Goo, right here on Torch Lake Views. Mycologists will have a field day. I’m going to go call Margie. I haven’t seen her since she wrote about that shaggy mane omelet and it’s a little worrying. And then, just to prove there’s something sinister going on, this just in from Maryanne Jorgensen: They [her Indian Pipe] are still here but dry. Remember the Indian Pipe in the swamp behind the Writing Studio and Bait Shop? Well. Maryanne has a patch of her own over at the Torchport, and she’s been keeping an eye on it. Hers has turned nice and toasty brown, drying out as is proper for a weed. Not mine. 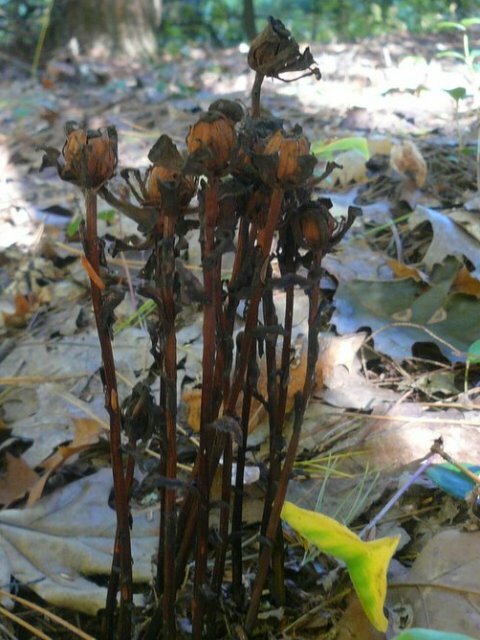 My Indian Pipe blackened, deliquesced like the Wicked Witch, and disappeared back into the swamp from which it emerged. I think Maryanne’s patch is merely trying to lull her into complacency. I promised you truly scary things this month, and I haven’t even gotten to the doings of the Township Board. The images of ‘Parykblækhat’ – directly translated from danish ‘Wick ink hat’ are very good. They should be cooked as soon as possible after harvest or else they turn into ‘ink’. Be sure they have their ‘wick’ on. Otherwise: leave them. You and Margie and Andrea are in accord. I am dubious about eating anything that ultimately commits suicide by digesting itself. That sounds pretty spooky, Carsten. On the other hand, I cheerfully eat my own cooking, so I suppose the marginal risk is slight. If Margie’s still with us I might be persuaded to try an omelet. Really? The Victorian mourning brooch is an elderly shaggy mane? I have a fondness for SMs (seeing, not eating), as they are one of the few mushrooms I can identify. Usually. I would not have known them in their old age. Sigh. What does that bode for us as the years go by? Now there’s a scary thought, if you ask me. My very thought. You have gotten to the heart of the matter, PJ. I came over to see about a mysterious mushroom but that mystery has been solved from all corners of your little township. I posted a mushroom photo today and have no idea what it is either. Well I just went and looked at your mushrooms and ferns and they make a lovely ensemble. Deadly, probably, but lovely. And please note, solutions to the mystery were supplied by corners of Leelanau County and Pennsylvania and Denmark as well as Torch Lake Township. We are a cosmopolitan bunch. I believe all those places ARE part of your Internet township. 🙂 Should have included “Internet” in my first comment. I could never trust my judgement on such things, I’ll look and admire such things of beauty (if a little sinister) and buy my mushrooms from the shops. I’m trying to imagine Wes Knecht–who is a very fine pharmacist and genuinely cares whether my blood pressure is under control–I’m trying to imagine him inspecting my haul of wild mushrooms for me, but I keep collapsing in giggles. As we often observe around here, the French are different. Yes… I made a mistake about the name. The “ink” part was dripping on the leaves of our lawn, so I was impressed by it. 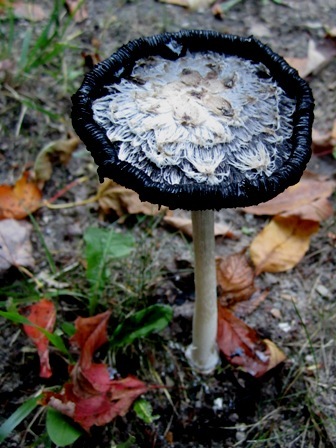 But, my guide also identifies it as “Sharggy Mane” or Coprinus Comatus. This particular shroom has no dire effect w/alcohol. But it’s cousin, the Alcohol Ink-cap, a.k.a. 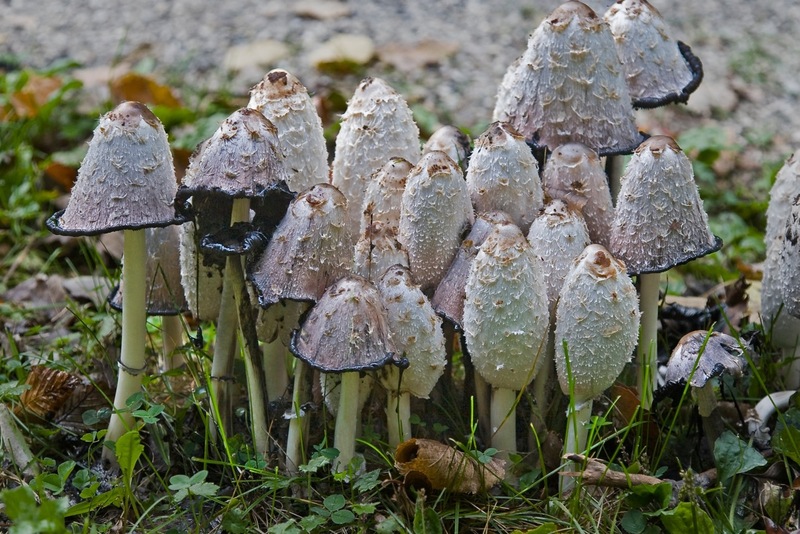 Common Ink Cap, (Coprinus atramentarius), causes drastic gastric difficulties if alcohol is consumed for up to several days after eating. It’s a cautionary tale, it is. Your miscreant cousins can put your innocent self in a suspect category. I’m glad you reminded me of the Mushroom Man. I was going to do a story about his cultivated mushrooms back last year but we never got together on it. I should look him up again. He really does know a lot about the fungi of the world. Seems like there are a lot of mushrooms this year. Was kinda hoping my mushroom-hunting-expert-lady would call with an invite, but she’s pre-occupied with other adventures. Love these pictures! Don’t know about the sinister aspect, though. lol! There are. I took pictures of a whole different kind today. They looked like tennis balls left by playful dogs. But I’ve sworn off any more mushroom posts for awhile. I’m on to autumn leaves. The Shaggy Manes are quite lovely in their lacy youth but you’re right….GAHH! Is that what we have to look forward to? Funky things going on there! What do you mean “look forward to”? I am an old bat and have already proceeded right past middle age to GAHHH! But it isn’t so bad. I am surprisingly spry.